You can vary the ingredients of this British classic according to your favourite veg. 1. Cut all the vegetables into bitesize pieces and place in a bowl. Add the salt and stir to mix, then cover with a clean tea towel and leave to stand in a cool place for 24 hours. 2. The next day, drain and rinse the vegetables thoroughly under cold running water. Drain again and pat dry. Reserve 2 tbsp of the vinegar and pour the rest into a large pan with the sugar and the spices. Heat gently to dissolve the sugar then bring to the boil. Add the vegetables and return to the boil. 3. Mix the cornflour with the reserved vinegar and add to the pan. Stir together then simmer for 5–6 minutes until thickened. The vegetables should retain a little bite and the liquid reduce. 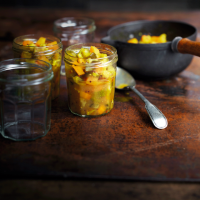 Pack into warm, sterilised jars (see the Cooks' tip on page 32), seal with vinegar-proof lids and leave to cool. Store for 6 weeks in a cool, dark cupboard before eating.